I'm bored! How many times have your kids uttered that phrase? If you want to put an end to it, consider investing in some outdoor play equipment. This will give children something to do when playing outside and will eliminate virtually every assertion of boredom during the warm weather months. Every kid likes to jump. Why not get them equipment that was specifically designed for this purpose? Trampolines are fun for the whole family and provide a healthy activity that is proven to improve fitness and muscle coordination. When used properly, trampolines are safe for every child. Both our round trampoline and our rectangular trampolines include safety enclosures for specific models maximizing your children's safety. Their use is a therapeutic way of helping in the development of physiological, communicative, and perceptual aspects of a child's growth. Kids who like to jump also like to climb. Installing a wooden climbing frame in your garden will help your children to naturally develop coordination, agility, and strength. Climbing frames also help children get the daily exercise they need to be physically fit. 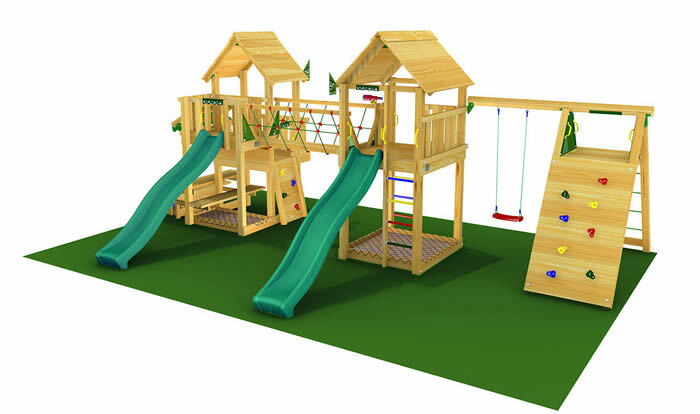 There are many different features that can be incorporated into a wood climbing frame, including slides, swings, ladders, climbing ropes, and forts. Before investing in a frame, consider asking your child what their favourite activities are. This will help you to pick the structure best suited to their personality. There's nothing wrong with kids watching a little television, but this indoor activity can get too monotonous. Outdoor play is much healthier for children and can help to enhance their intelligence and physical fitness level. While encouraging your children to play outside is very beneficial to their health, it also gives you a little bit of quiet time to concentrate on the things you need to get done. If you want your children to play outside often, consider investing in a trampoline or climbing frame. These objects are durable and will prove to be two of the best toys you ever bought.